3rd Grade Teachers should register here for free cabbage plants, delivered from the closest Bonnie Plants growing station. Registration deadlines and delivery times vary by location. 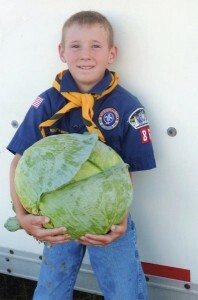 Teachers can submit a photo and measurements of a child's cabbage to be considered for the state scholarship. A $1,000 scholarship is given to a winner in each state. If necessary, parents may submit entries for their children. Gardening is often about problem solving. Here are a few potential problems you might find with your cabbage and how to solve them. You can learn more on the How to Grow Cabbage page of the Bonnie Plants website. If you leave your cabbage in the garden for a while after the head is formed and your garden gets lots of rain, the head may crack or split. If this happens, an adult should cut the head as soon as possible. Something is eating your cabbage. If you see moths flying around your cabbage, look for cabbage worms on or around the plant. The moths come from these worms, which may eat your cabbage. Kids should remove any worms with an adult’s help. Clubroot is a common disease that affects cabbages. The most obvious symptoms are yellowing, wilting leaves. Avoid this problem by keeping your plant healthy and your garden clean. Also, don’t plant cabbages or other related veggies (such as broccoli, kale, or collards) in the same spot year after year. If your cabbage send up a flower stalk instead of forming a head, it is bolting. This happens when the plant goes to sleep during a long cold spell, then goes to seed when the weather heats back up. If this happens, a head won’t form — but you can still eat the leaves! Harvest them as soon as you can, or they’ll start to taste bitter. © 2019 Bonnie Plants, Gardening With You Since 1918.